Brassicas are the health-food world darling. Broccoli and cauliflower are two of the most commonly available brassicas (go ahead and add cabbage and Brussels sprouts to that list). In general, it's a family of vegetables that respond well to a wide variety of cooking methods. Roasting, in particular, brings out the sweet nature hidden deep inside their sometimes bitter selves. The key to roasting any vegetable—especially vegetables in the brassicas family—is simple: high temperature and enough time. You want crispy edges, browned sides, and a fully tender interior. 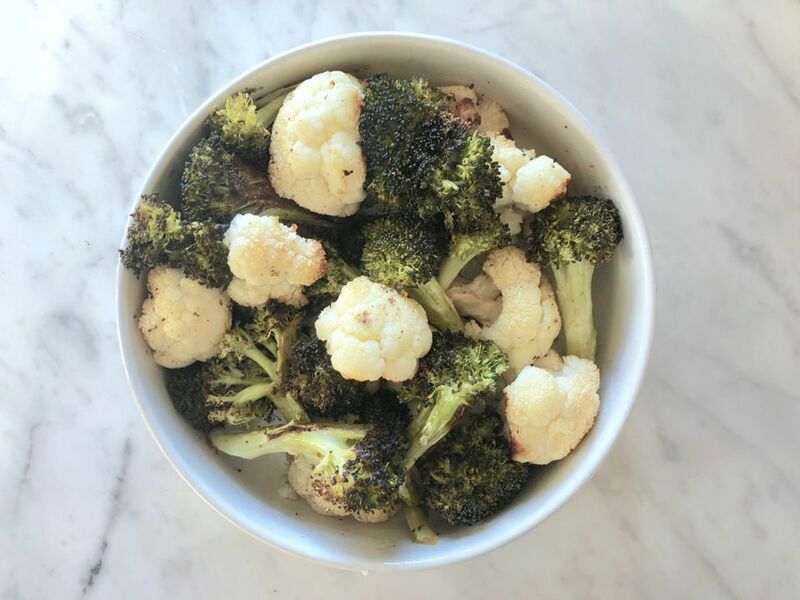 For the perfect batch, make this your mantra: Preheat the oven the minute you think of roasting broccoli and cauliflower, cut them into even florets, coat well with oil, season thoroughly, and cook a little longer than you think is necessary. Preheat an oven to 425 F.
Trim off any excess broccoli stems (don't toss them, peel them!). Cut apart the florets, slicing any larger ones up and through their stem end until the florets are more or less the same size. Trim off and discard any leaves from the head of cauliflower. Cut out and discard the core of the cauliflower. Slice the florets apart: go up and through the stem end to make the florets all about in a size that's comparable to the broccoli florets. Spread the broccoli and cauliflower florets on a sheet pan or in a large baking pan. Drizzle with the olive oil and toss to coat the florets evenly and thoroughly with the oil (you can use two spoons for this, but your hands will do a better job). Spread the broccoli and cauliflower florets evenly on the pan. Arrange them cut-side-down as much as possible to maximize browning. Season the vegetables with the salt and pepper. Roast until browned and tender, around 30 minutes. Cover the florets with a clove or two of minced garlic along with the olive oil for an extra flavor boost. Mince a fresh chile or two, sprinkle them on before roasted for a spicy kick. Add some spices: try 1/8 teaspoon cayenne, 1/4 teaspoon ground cumin, or 1/4 teaspoon garam masala. Use sesame oil instead of olive oil and sprinkle with 1 teaspoon sesame seeds (white or black, or a combination) before serving. Sprinkled 1/3 cup finely shredded Parmesan cheese on the vegetables when you take them out of the oven and then spritz with lemon juice before serving. Herb it up with 1/4 to 1/2 cup chopped fresh herbs before serving—parsley, dill, or cilantro are easy choices; if you want to go with rosemary or tarragon, use a smaller amount since they pack a lot of flavor in those tiny leaves. Make the Most of Winter Veggies—Roast 'Em!